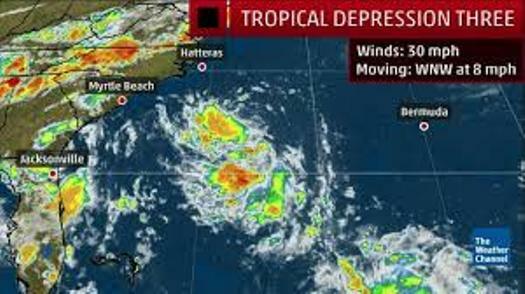 Tropical Depression Three has formed several hundred miles southeast of North Carolina and will become Tropical Storm Chris this weekend. Infrared satellite imagery indicates showers and thunderstorms are gradually becoming more numerous and consolidating a few hundred miles southeast of Wilmington, North Carolina, enough so that the National Hurricane Center has upgraded the system to a tropical depression. The National Hurricane Center says intensification is likely over the next few days, and it could become a hurricane on Tuesday or Wednesday. Several hurricane hunter flights have been scheduled to see how well organized and how strong the system is. The first of these flights is scheduled for Saturday morning. The rest of the forecast at this time is tricky. Here’s what the National Hurricane Center has come up with followed by our forecast reasoning. This system isn’t going to move much over the next few days. Stalled tropical cyclones, such as Debby in 2012, are notoriously difficult to forecast. Tropical Depression Three is too far south to be grabbed by the southward dip in the jet-stream currently bringing heat relief to the Northeast. When that jet-stream dip goes by this weekend, it will be replaced by another expanding heat dome of high pressure aloft building into the Midwest and East. This new heat dome will trap the depression near or off the Carolina coast into early next week. Exactly where this system stalls remains uncertain and will hold the key to some impacts. If it stalls too far off the coast, the only impacts at the coast from southeast Virginia to the Carolinas may be building surf, rip currents, some coastal flooding at high tide, and occasional showers this weekend into early next week. If it stalls closer to the coast, some areas may experience heavy rainfall and stronger winds. Then there’s the intensity forecast. A stalled tropical system over the Gulf Stream, where surface water temperatures are above average, will likely allow this system to become a hurricane, assuming wind shear remains low and dry air doesn’t impact the system. But, if this system remains too stationary, it could upwell colder waters and cause itself to weaken. By mid-late next week, another southward plunge of the jet stream is expected to grab this system and send it into the north Atlantic Ocean.